On March 7 1939, a few months before the beginning of the Second World War, and just nine days before Germany invaded Czechoslavakia, a German woman called Gertrud Scholtz-Klink arrived at Croydon Airport. Described by Hitler as ‘the perfect Nazi Woman’ she was met at the aeroplane by the wife of the German Ambassador Frau von Dirksen. A few hours later Scholtz-Klink was introduced to Lady Douglas-Hamilton, more well-known as Prunella Stack, who, as leader of the 200,000 strong Women’s League of Health and Beauty, was at the time one of the most famous women in Britain. Coincidentally the 25 year old Prunella Stack was also known as perfect and called ‘Britain’s Perfect Girl’. They were both at a dinner at Claridges organised by the Anglo-German Fellowship who had invited Scoltz-Klink over to London, ostensibly, “to study the work done by and for English women” but in reality to publicise the connections and similarities between the two nations, despite an almost certain war approaching. Lord Halifax, the Duke of Saxe Coburg Gotha, and Joachim von Ribbentrop at the Anglo-German dinner. 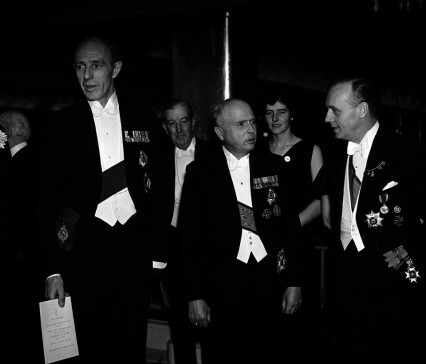 The Anglo-German Fellowship, of which Prunella Stack’s husband Lord David Douglas-Hamilton and brother-in-law Douglas Douglas-Hamiton MP were both members, was an upper-class and it would be fair to say a predominately right-wing organisation. In fact many of the fellowship were almost unashamedly pro-Nazi and anti-semite. No foreign propagandist bent upon blackening Germany before the world could outdo the tale of burnings and beatings, of blackguardly assaults on defenceless and innocent people, which disgraced that country yesterday. 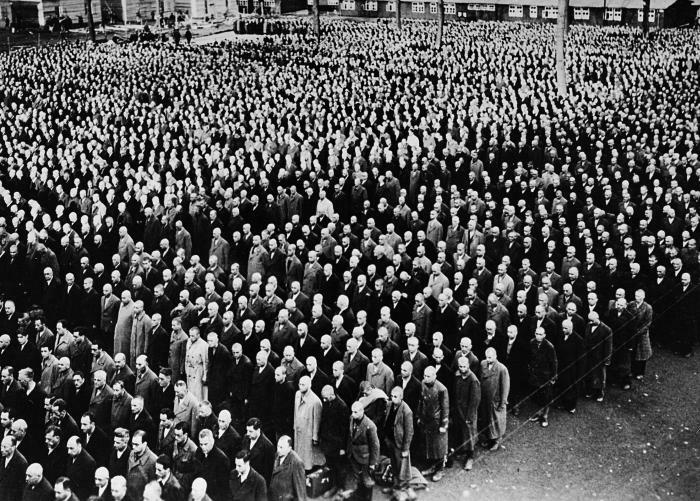 Jews arrested during Kristallnacht line up for roll call at the Buchenwald concentration camp, November 1938. The mission of woman is to minister, in the home and in her profession, to the needs of life from the first to last moment of man’s existence. Considering she was a leading Nazi the Fellowship was utterly unembarrassed making sure Scholt-Klink was made particularly welcome. The day after she arrived she again met the 25 year old Prunella Stack who, with photographers present, was taking an evening class of the Women’s League of Health and Beauty at the League’s headquarters at the Mortimer Halls in Great Portland Street. 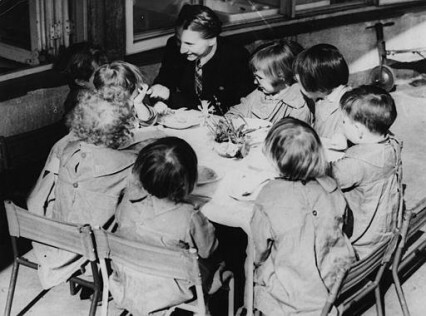 During the remainder of her three-day stay, the German woman leader visited the headquarters of the Mothercraft Training Society at Highgate, the Lapswood Training School for girls at Sydenham Hill and the South London Hospital for Women near Clapham Common. 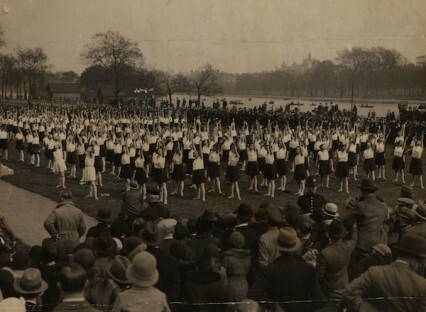 Nine months before Gertrud Schlotz-Klink’s visit to London, during the summer of 1938, five thousand enthusiastic members of Prunella Stack’s Women’s League of Health and Beauty had performed in front of a huge crowd on the bright green grass of the fifteen year old Empire Stadium in Wembley. The finale of the ‘Empire Pageant’ was meant to feature an impressive Greek-influenced athletic dance with women in white tunics carrying swords, shields and javelins. Order was eventually restored and 24 year old Prunella Stack – the woman that the Daily Mail had only recently described as ‘the most physically perfect girl in the world’ – climbed to the top of a thirty feet high column and raised her burning torch high above her head. On the pitch below, utterly in awe, the five thousand rank and file members of the League of Health and Beauty looked up at her and soon waves of applause that echoed around the twenty-five year-old stadium. The original Bagot-Stack Dancing Academy dancing at Clacton 1928. 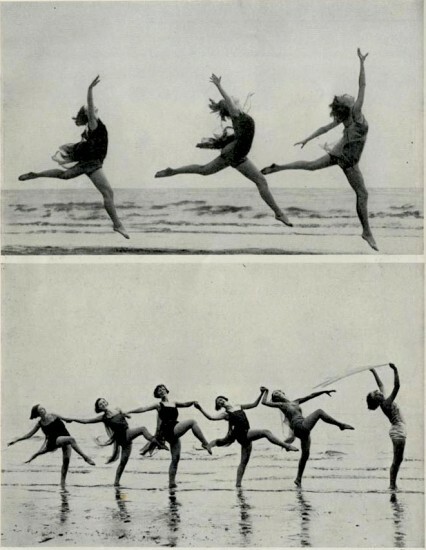 The dancers were apparently ‘in harmony with the rhythm of the wavelets lapping the sand and with the vibration of the sunlight on sea and shore. Every movement was an object lesson in the expression of the strength and health and passionate joyousness of pulsing natural life.” I totally agree. 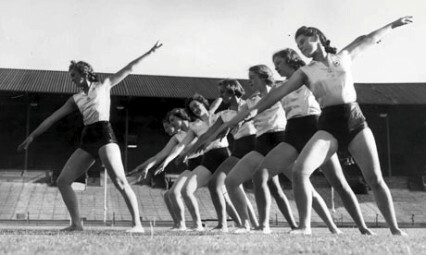 The Women’s League of Health and Beauty had been started in 1930 by Prunella Stack’s mother – Mary Bagot-Stack – a First World War widow who believed, not unreasonably, that rigorous exercise would help get a nation fitter. I jumped out of bed, said my prayers, had a cold bath, opened my windows, stripped off my clothes, and set going on my gramophone the gayest jazz tune I could find, and I exercised around my bedroom in physical bliss. This ‘skin-airing’ should be practised daily with nothing on..I like the goal of beauty, and beauty is unself-conscious,“ she imagined a world where the women are so beautiful that they are an inspiration rather than a temptation – a joy to themselves and everyone else. Women are the natural Race Builders of the world. 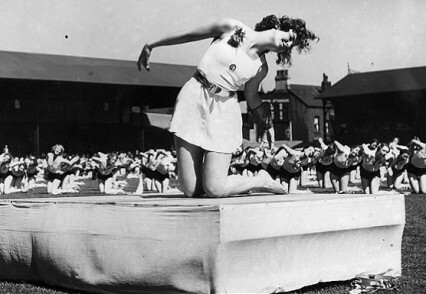 The ‘classlessness’ of the League was stressed at all times and this was helped by members exercising in the same uniform of rather daring satin knickers and a sleeveless white blouse. 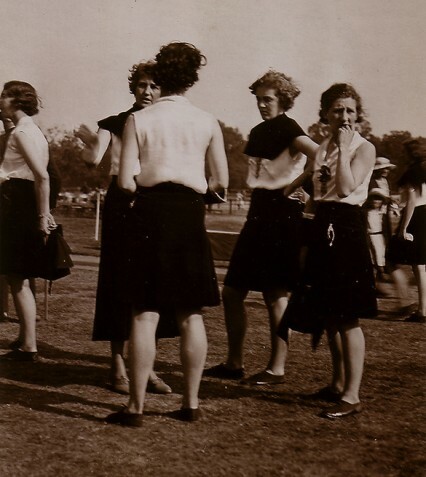 Members were advised to shave under their arms, use a deodorant, and make sure they always had a clean handkerchief stuffed up their left knicker leg. 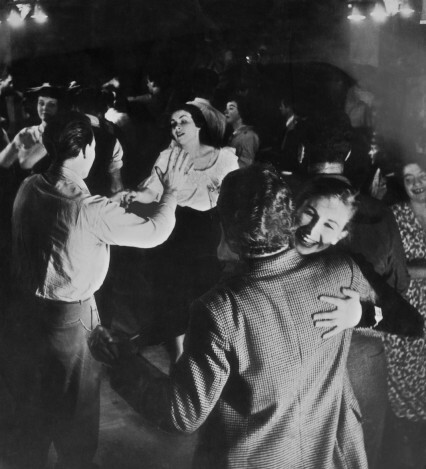 To attract publicity the League quickly began to perform at public events and in 1935 two and a half thousand women performed at a huge event in the Grand Hall at Olympia in West London. 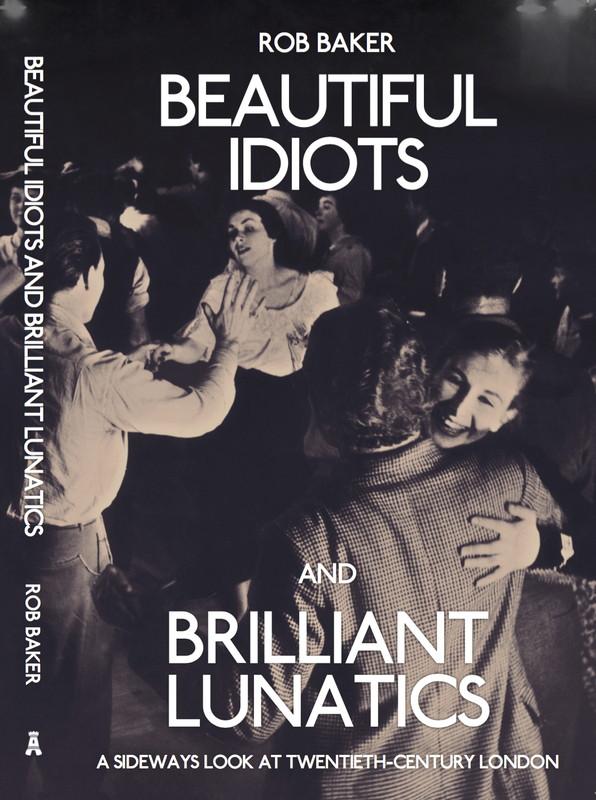 It was less than a year after Oswald Moseley’s British Union of Fascists had their infamous rally at the same location where the violent behaviour of the BUF stewards caused the Daily Mail to drop support of the party. 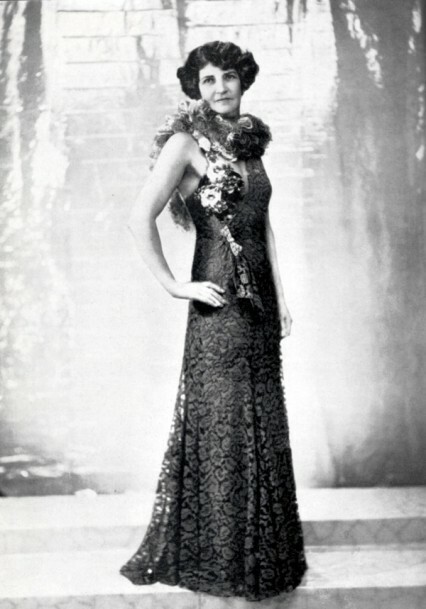 The queen of this wonderful spectacle was Miss Prunella Stack. Nothing more exquisite could be imagined than her beauty and her glamour – beyond the dreams of Hollywood. 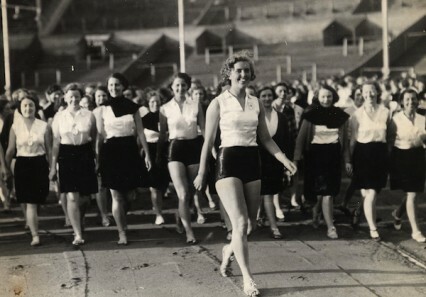 If Douglas was impressed with the young leader another nameless journalist in the Daily Express writing on 1 April 1938 described the Women’s Health and Beauty dancers as ‘Stormtroops’ and Prunella Stack as – a radiant, strapping, 23-year-old Nordic, with excellent teeth” and captioned a photograph of her at Wembley – ‘Fuhrer Stack’. She studied new methods of physical training last year in Berlin and ‘she’s frightfully keen on anything German’ I was told. Prunella Stack – “Nothing more exquisite could be imagined than her beauty and her glamour.” Or “Fuhrer Stack” which ever you prefer. 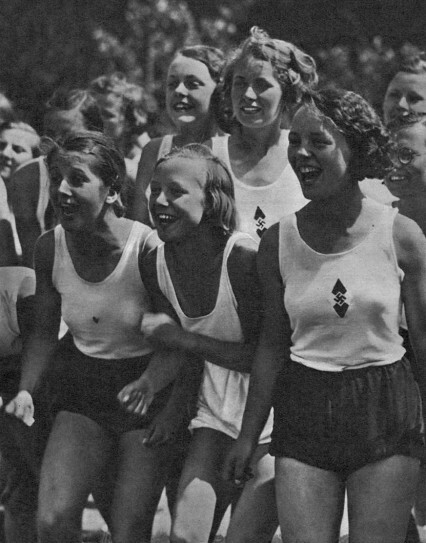 A worrying Government report in 1935 had estimated that over 90 per cent of boys between fourteen and eighteen years of age never engaged in any form of physical activity whatsoever and after a very disappointing performance in the Berlin Olympics a delegation from the Board of Education had gone to Germany to have a look at how physical education was being taught there. The delegates particularly admired the ‘excellent work’ of the Kraft durch Freude (Strength Through Joy) movement. The KdF started in 1933 and was started with the aim of breaking down the class-divide by making middle-class pursuits available to the masses. 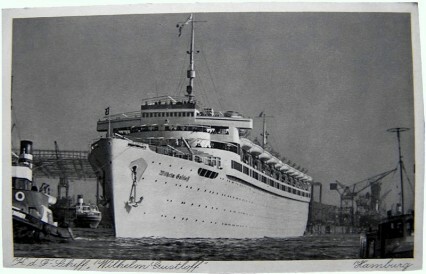 It provided affordable leisure activities such as concerts, plays, day-trips and holidays and for this large specially-built cruise ships such as the Wilhelm Gustloff (named after the assassinated Swiss Nazi leader whose wife was once Hitler’s secretary) were built. Bund Deutscher Madel or BDM was the girls’s wing of the Nazi Party youth movement. Certainly the most agreeable and possibly the most instructive phenomenon of the Third Reich. In the matter of attention to physical development we may surely learn something from others. Nothing made a stronger impression on visitors to the Olympic games in Germany this year than the splendid condition of German youth. In 1937 Prunella had been invited to join the board of the National Fitness Council which had been put together to oversee the government’s Physical Training and Recreation Act, that was intended to transform the non-splendid condition of British youth and ‘to make Britain an A1 nation’. 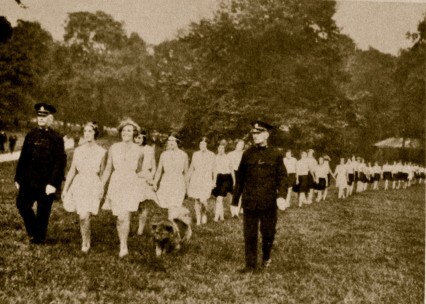 A ‘Keep Fit’ campaign was a low-key attempt by the Government to discreetly prepare for a war that they knew, even if the Anglo-German Fellowship hoped otherwise, was certainly approaching. 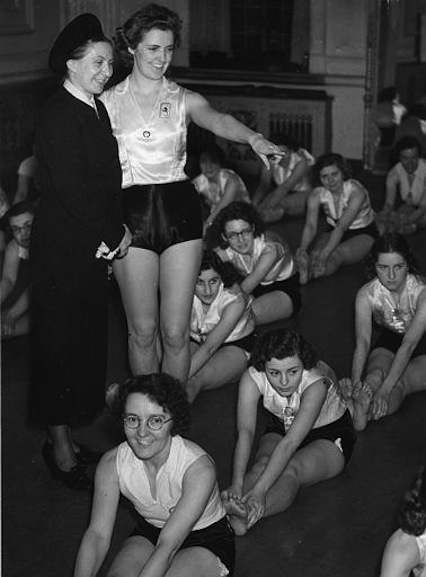 Prunella also visited Germany in the summer of 1938 after the League had been invited to participate that summer in a Physical Education Congress sponsored by Kraft durch Freude. 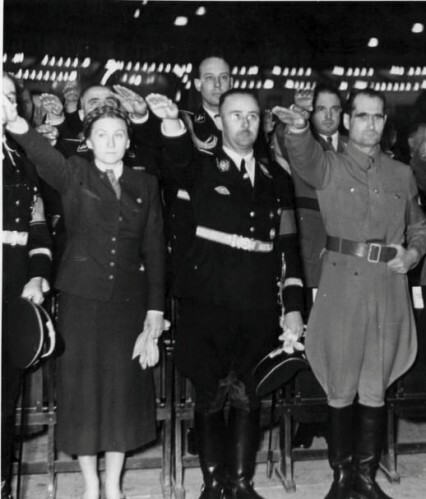 It was reported in the British press that at one point she gave a Nazi salute. 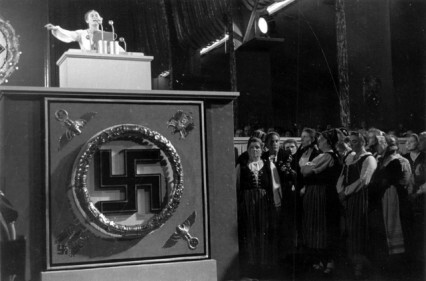 Prunella and the rest of the League women stayed on the Wilhelm Gustloff from which they watched mass demonstrations of German physical culture and folk-dancing. 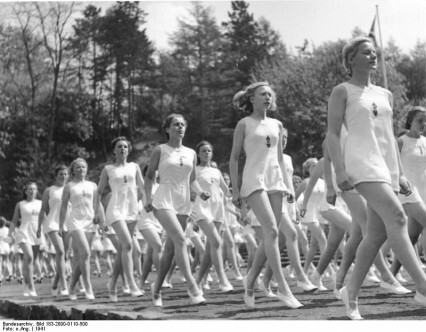 The British Women’s League of Health and Beauty performed twice – “their neat black and white uniforms and slim figures contrasted with the generous build of the blonde German girls,” Prunella later wrote. On the ship she was introduced to the Reichsportsfuhrer, Herr von Tschammer und Osten, Dr Ley, the leader of Kraft durch Freude and even Himmler. A few months after the Anglo-German dinner at Claridges in September 1939 Germany invaded Poland and the Second World War began. The League’s impressive pre-war membership started to plummet when many of it’s women were called up or had no time for classes. Now pregnant, Prunella moved to Dorset while her husband, as all his brothers did, joined the RAF. In May 1941 Rudolf Hess, the deputy Nazi leader, flew to Scotland in the supposed hope that he could broker an amazing diplomatic victory by securing peace between the Germany and Britain. After parachuting from his plane and captured by a local farmer Hess said he had come to meet the Duke of Hamilton whom, he insisted, he had met in Berlin in 1936. 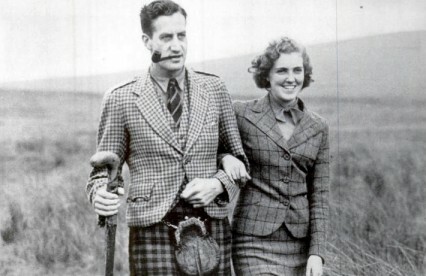 Indeed Douglas, Prunella Stack’s brother in law and who had only just become the Duke after his father had died, had been in Berlin during the summer Olympics as part of a multi-party parliamentary group. While in Berlin Douglas-Hamilton met Hitler and Goring at a grand dinner hosted by Von Ribbentrop – the German ambassador to Britain. The Duke of Hamilton always said that he had never personally met Hess and indeed sued anyone who suggested otherwise. 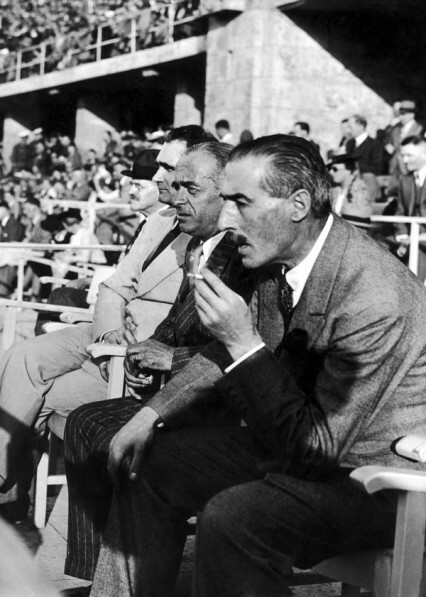 Neville Henderson the British Ambassador to Germany watches the football match between England and Germany (who had just incorporated the useful Austria team) in Berlin in 1938. 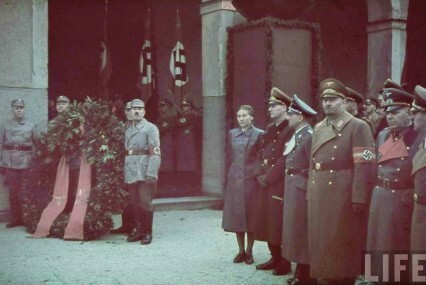 Behind him are Hitler’s deputy Rudolf Hess and von Tschammer und Osten. The England team, including Stanley Matthews, gave the Nazi salute but won handsomely 6-3. On 30 January 1945 the Wilhelm Gustloff, by now a floating army barracks, was sunk in the Baltic sea by three Soviet torpedos. 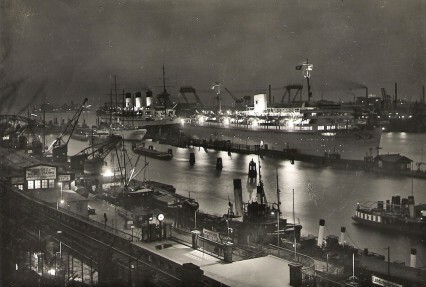 The former luxury cruise-liner was bringing back refugees, military personnel and Nazi officials from East Prussia after they were surrounded by the Red Army. It has been estimated that 9400 men, women and children died after the ship sank in just 45 minutes, making it the worst maritime disaster ever. The previous year in 1944 Prunella’s husband Lord David Douglas Hamilton died after his Mosquito plane crashed with engine failure just short of the runway at RAF Benson. Like her mother, Prunella was widowed at the age of just thirty. After the war she remarried and moved to South Africa with her second husband but returned for the Queen’s Coronation in 1953 accompanied by a controversial (in South Africa) multi-racial group of League members. Three years later she returned to London with her two sons for good. At end of the war, in the summer of 1945, Scholtz-Klink was briefly detained in a Soviet prisoner of war camp but quickly escaped. 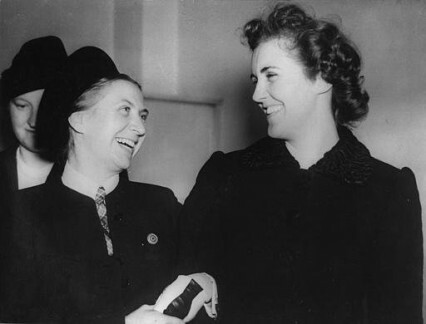 With her third husband, SS officer August Heissmeyer, she went into hiding but was caught three years later and imprisoned until 1953. She died in 1999 still an avid supporter of National Socialist ideology. The Women’s League of Health and Beauty continues to this day although now with the more modern sounding name of the The Fitness League. Prunella died in December 2010 at the age of 96 outlasting by seven years the old Wembley Stadium where she had performed with her Women’s League of Health and Beauty so memorably sixty-five years before.